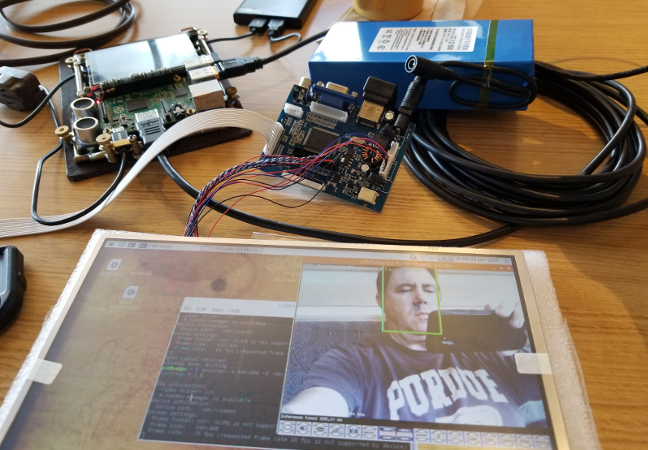 The 15,000 mAh lithium-ion battery and 10.1-inch color LCD HDMI display arrived this past week, so imagine my excitement to finally have a portable way to interact with a Raspberry Pi or any other HDMI capable device, without a wall outlet or an external Linux notebook. A good resolution LCD display makes a world of difference for Dr. Torq-style, on-the-go development. I work on physical computing projects in conference speaker lounges, my home office, down at my Dad’s house and off-sites, like Panera Bread. Even my desktop 19-inch LG monitor is simply too big to haul around when building out my gadgets. The LG also needs to be plugged into a wall outlet. The 10-inch, battery-powered LCD monitor, which I’ll fashion into a rugged steampunk themed mobile monitor, is just what I need for my physical computing in-the-field (sometimes literally) development work. The bare LCD display arrived from China in a cardboard box, between two slabs of closed-cell foam. The box also contained the matching driver board, a small display control board, a control board cable and a cable to hook the display to the driver board. The display cable has very fine wires and the connectors are pretty fragile so care should be used when handling. I had to laugh. Instructions? We don’t need no stinkin’ instructions. Actually, there wasn’t any documentation enclosed at all. Oh, well. Off-the-shelf hackers are the ones who end up writing the directions anyway. It only took a moment to plug in all the cables. 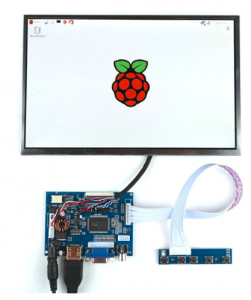 The display driver board was hooked up to Hedley‘s Raspberry Pi 3, by a 25-foot HDMI cable. I ordered this one and a little 18-inch cable, at the same time as the display. The long cable takes care of placing Hedley some distance from a projector, while the short cable will work for close-up demos, like when the display is right next to him. The driver board can also handle VGA and composite video inputs. This will be convenient if I want to resurrect old “antique” PC boards for projects or view video feeds from hardwired video cameras. One thing about ordering parts from China, at least to the U.S., is that you never know exactly when they will be delivered. I expect everything usually within two to four weeks. There are two ways to power the LCD panel, either the 15,000 Li-ion battery or a wall wart. The 15,000 mAh Li-ion battery came with a 12.6-volt wall-wart. Unfortunately, Banggood shipped the European model with two round prongs instead of the dual-blade style used in the US. I’ll probably find a European-to-US adapter or hack in a standard US power plug at some point. An adapter might be easiest since I’d love to take Hedley on a European tech conference tour. I covered the challenges of powering Stackie the PancakeBot in Europe, in a past article. Running Hedley, my robotic talking skull, and his little display presents a similar situation. On the good side, I had a spare 12-volt wall-wart with the correct power connector that seems to charge the battery. It’s a large battery and probably takes about 20 hours to fully charge. The battery plugs right into the power port on the LCD driver board. A green LED lights up when the board is connected to power. The 12-volt wall-wart, by itself also worked fine for powering the display. I’m happy to report that the screen is bright and clear. The 1280×800 resolution is awesome and worked right out of the box. A lower resolution would have you scrolling left and right to see the whole screen. A higher resolution and you’d need a magnifying glass to read small text. The main reason I wanted a small portable display for Hedley is to give a first-person view of what he sees through his JeVois smart sensor. A battery powered display would have really helped at our after-hours pub demo in Portland. I hadn’t tweaked the settings well enough for Hedley to track me in the low light environment. The display would have allowed me to optimize the guvcview settings during the demo. Check out Hedley’s “skull top” display. Looks like any other desktop, which of course, it is. 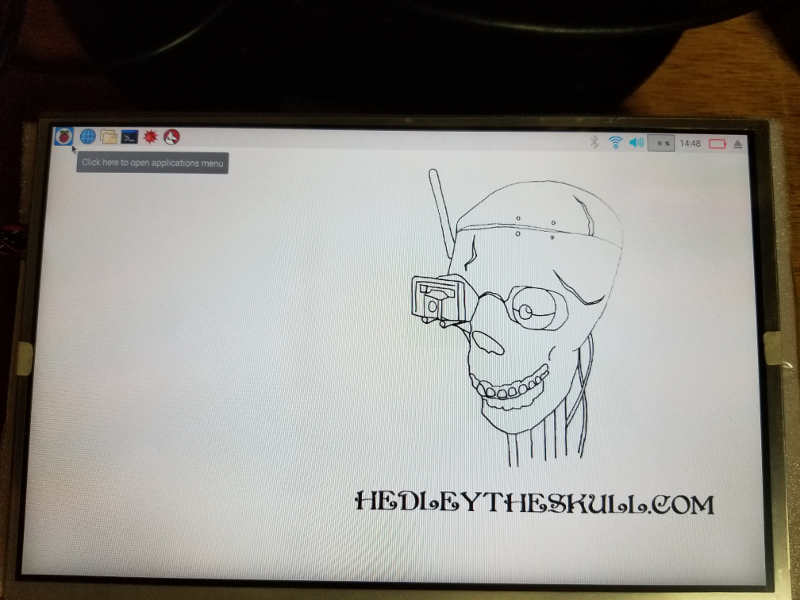 The display will be handy for showing small audiences of one to three people how Hedley reacts to the different artificial intelligence algorithms, in the JeVois sensor. Each algorithm is keyed to a specific camera resolution that is selected in your chosen video viewing application. guvcview has a popup window for selecting the resolution and thus the JeVois algorithm, right there on the desktop. I typically run luvcview with the selected resolution spelled out in the command line. Regardless of the viewer program, it is easy and fast to tweak settings on a regular-sized desktop interface. Next week Hedley and I will be presenting at the Embedded Systems Conference in Minneapolis. We are always happy to talk to readers so if you are at the conference, be sure to stop by and say hello. When I get back, building a ruggedized, portable steampunk enclosure for the LCD display will be a top priority. I also have three Node-MCU ESP8266 boards sitting on my desk, waiting to be installed in some new projects. Check out Dr. Torq’s Off-The-Shelf Hacker column each Wednesday, only on The New Stack.